Find out the latest happenings here. If you would like to know what our company has been up to, we invite you to read our company newsletter, Called to Care. In it you will find a message from our president, Sean Russell, information about our educational offerings, and some stories about people going above and beyond. We hope you enjoy reading it. In our Newsroom, we have posted all our press releases with information about more significant company events. REACH is proud to present educational conferences for the benefit of our hospital and EMS partners. This year’s scheduled events include more great topics and speakers. If you would like to be notified when we have a conference in your area, please email conferences@reachair.com and provide your name, city, state and email address and ask to be on our mailing list. Many of our patients have such amazing stories to tell. And some have been gracious enough to share their experience of what it’s like to have an emergency medical transport with us. We are honored to share these patient story videos with you. If you have ever wondered what it’s like to work at REACH, you can now see for yourself. 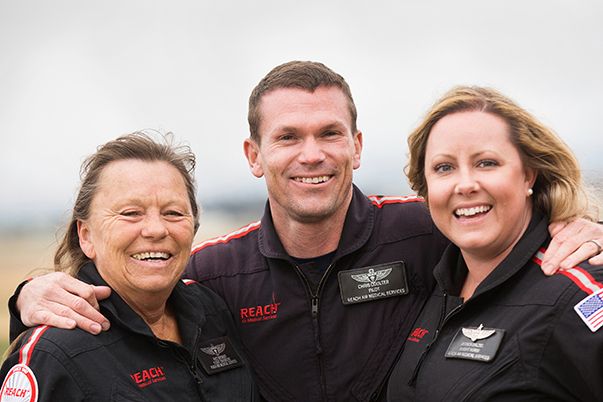 Our employee videos offer a glimpse into the real world working as a Flight Nurse, Flight Paramedic, Pilot or Aircraft Maintenance Technician at REACH.